Now that you know a little more about Invisalign® teeth straightening treatments and how they work, you’re probably wondering about the logistics, such as the cost of Invisalign, what our dental consultations are like, and how often you’ll need to visit our Ottawa dental clinic for checkups and new Invisalign retainers. 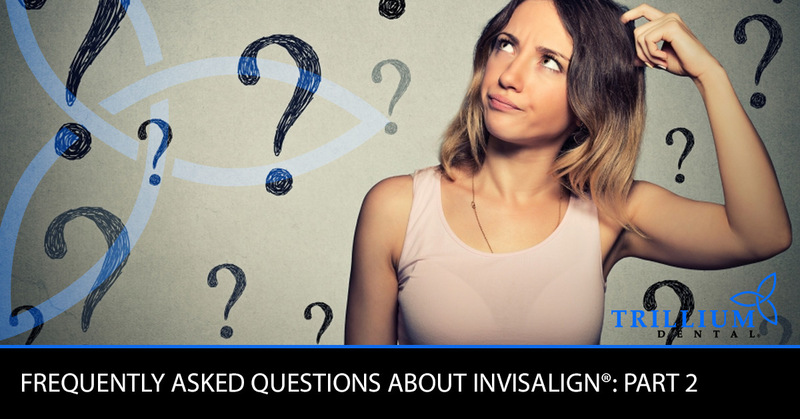 Here in part two of this blog series, our team at Trillium Dental will dive into some of the finer details of our Invisalign treatments, so continue reading for answers to more commonly asked questions about Invisalign! As family dentists, we get this question all the time, and the truth is that the price of Invisalign treatments varies from person to person. This is because some dental patients will require more Invisalign retainers than others (especially if they have a drastic overbite, underbite, or overlapping teeth), as well as additional dental appointments for checkups or to replace lost retainers. Another factor to consider is dental insurance, as some dental insurance plans cover teeth straightening treatments and others do not, and in many cases, they only cover a certain percentage or monetary amount of the overall cost. Nevertheless, the cost of Invisalign is typically very similar to the cost of braces, as recent advancements in dental technology have made this method of teeth straightening more accessible for many dental patients. Where Can I Get Invisalign Retainers? How Do I Start An Invisalign Treatment? Since every patient’s smile is unique, we begin every Invisalign treatment with an initial consultation at our Ottawa dental office. During this appointment, our dentists will look at the current alignment of your teeth in order to determine how you could benefit from this teeth straightening method. Here, we’ll assess your dental insurance coverage and payment options, then take a look at your bite, the space between your teeth (gaps, crowding, or overlapping), and your overall oral health. If we determine that you would be a good candidate for Invisalign, we’ll schedule another dental appointment where the first set of Invisalign trays is molded to your teeth. Then, you’ll return for regular dental checkups throughout the treatment period (typically every four to six weeks) to ensure your progress with Invisalign. Invisalign is the preferred teeth straightening method of many dental patients in the area, and we are pleased to offer this cosmetic dentistry procedure at our Ottawa dental clinic. Contact us today to check out Invisalign before and after photos or read Invisalign reviews from happy patients we’ve helped in the past. Our family dentists understand the importance of quality dental care, so please don’t hesitate to get in touch with us for more information about Invisalign or any of our other dental treatments. If you have further questions about Invisalign, contact our dentists today or book your consultation online at Trillium Dental in Ottawa. We look forward to meeting you!